Dawnstar of Starhaven, aka Bounty. Created by Paul Levitz and Mike Grell. Dawnstar was a member of the original version of the Legion. She was of American Indian descent, and her powers included flight (including spaceflight, at speeds high enough to make it worthwhile) and psychic tracking. She first joined the Legion out of the Legion Academy. During the Five Year Gap, she was taken over by an entity named Bounty who caused her wings to be cut off, among other indignities. 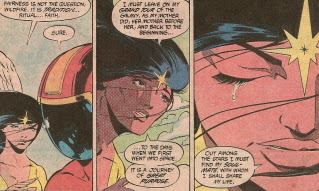 Dawnstar didn't appear in the reboot Legion (although a comparable character, Shikari, did) and hasn't yet appeared in the threeboot. However, there are strong hints that she's going to show up (with her wings) in the pages of Justice Society of America as part of their Starman storyline, possibly leading to some kind of return to active continuity of the original Legion. Dawny was... she was the kind of superhero character who works best in a team book. First of all, she can handle herself okay in a fight but doesn't actually have any good offensive or defensive powers. As she put it in the first comic I ever saw her in, "I'm a tracker, not a stomper." Second, she didn't have the most attractive personality; she was kind of aloof, only ever really opening up to Wildfire, with whom she had a long star-crossed relationship. She was even a bit on the mercenary side: she made no bones about the fact that she first joined the Legion for money (which she sent home to her family, by the way). And I don't remember her ever having any fun. Even Saturn Girl would relax every now and then. In my entry about Chemical King I said that his powers posed problems for the writers, because to use Chemical King right you really have to know a thing or two about chemistry. 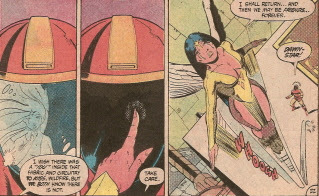 Dawnstar's powers are also a problem for the writers, but in a different way: they're easy to understand, but they can often blow your story right out of the water! See, Dawny can find anybody, even on the other side of the galaxy. And sometimes, to make a story work, you need people to stay lost for a while. So we got a lot of scenes where Dawnstar was standing on the bridge of a Legion cruiser, concentrating, a halo of tracky-mojo around her head, saying stuff like, "I think I've got him--he's out there--no, it's gone. And, no, before you ask, it wouldn't help if Brainy came up with a gizmo to amplify my powers." Dawny's powers must have failed her more than any other Legionnaire I've ever seen, but it wasn't her fault. It was just logistics. Now, as for what makes Dawnstar a great character... With Dawnstar, it's all about the look. This may sound like an obnoxious thing to say; after all, there is more to her than that. And I would never say such a thing about other Legionnaires, even the visually striking ones like Dream Girl or Tellus. But with Dawny the look is the key to everything: the magnificent white wings, the flowing black hair, the fringe on her costume, the star on her forehead... This is why the Bounty storyline was such a shame. I won't go so far as to say that there's no point to Dawnstar if you cut her wings off, but it's close. So, for a signature moment, let's try this quiet moment from LSH v2 #304, where, thanks to Messrs. Levitz, Giffen and Mahlstedt, she’s at her best in many ways.